The free Printable Nanny Log Template is the perfect sheet to help you create a schedule for your children. This template is a great tool for nannies and parents around the world. You can download the free template by following the link below. Not only do you get a free template to enter schedule items but you also receive a detailed structure to enter the items that matter. 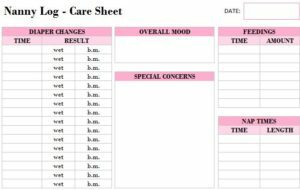 This template is very important to people that are also new to the babysitter game and need to know what a baby needs for proper care. You might not be familiar with the regular feeding schedule of a newborn and if you’re watching them for the parents, you can’t exactly ask them what they need. With this detailed report at your side, you never have to wonder. Get started today, by following the directions below. After downloading the free template, follow the simple set of steps below to fill it out with your own information. Enter date of care at the top. Enter each time you change a diaper and the reason it needed changing in the first column. Enter notes about any behavioral problems, special concerns (illnesses, dietary restrictions, etc. ), feeding, and nap times in the areas given. You can also enter special items like medicinal needs, dosages, and notes toward the bottom. In the last column of the template, you can also enter any supplies needed and notes. You can see how this template quickly becomes the Swiss army knife for all parents, babysitters, and professional nannies to narrow down the needs of their children so they get the care they deserve. You can become a true professional caretaker by downloading the free template today!